Tom Vanciel's vacant K Street home. K STREET – Lost in the bleating over Cypress Grove Chevre’s now-halted goat dairy project has been the passing of another, much tinier goatroversy. In recent weeks, complaints about Tom Vanciel’s K Street residence have accumulated almost as fast as colorful slogans espousing love and liberty have proliferated on the house’s front walls. Vanciel and housemate Samuel Sanchez have become known for their animal companions, including a yak and as many as nine goats. The two often walk their livestock around town, and the home they share at 1250 K Street has evolved into something of a suburban ranch. That kind of animal keeping isn’t permitted in areas zoned Residential Low-Density, the designation for that neighborhood. City Building Official Dean Renfer sent Vanciel a letter notifying him that three goats in his yard were a violation of Land Use Code Article 4, paragraph 9.42.050 last Sept. 27, but the animals remained. Arcata Police then attempted to cite Vanciel for the violation, but he reportedly shut his front door on an officer and wouldn’t open it, defying enforcement. Another City letter elevating the matter to a “Notice Of Nuisance” was sent Feb. 23., this time noting the presence of “what appears to be a Yak.” The letter ordered removal of the animals and warned of fines, but the beasts remained at the property. For Vanciel, the City complaints were just one node in a broad matrix of oppressive acts from several quarters, both official and neighborly. In a brief interview May 4 over his front yard fence, Vanciel related a number of instances of what he said was harassment and denial of his rights. He prefaced his comments with a concern that he asked be included in any news story: “I don’t know that I’m going to get a fair deal from you in the press,” he said. Describing himself as a disabled veteran, Vanciel said that in the course of his military service he had been ordered to form death squads in Central America. On refusing to do so, he said the military branded him a paranoid schizophrenic. After leaving the military, Vanciel said he lived “off grid” for 20 years, drawing disability payments for sustenance. In 2007, he got a loan from Bank of America to purchase the K Street house. Property records show the house having been purchased Aug. 21, 2007 by Thomas and Nancy Vanciel. But he, like many others, found himself “underwater” when the housing bubble burst, with his payments exceeding the value of his home. Vanciel claimed the bank had miscalculated his interest rate, and was charging too much. Apparently he had fallen behind on the payments, as, according to neighbors, Bank of America was foreclosing on the property. Another source of conflict was Vanciel’s neighbors, with whom police logs document numerous clashes. One complained that the fence he built around his house impinged on the neighboring property, which an APD officer confirmed. Other neighbors complained about the noise, odor and mess of his farm animals. Particularly troubling for Vanciel was Rich’s Body Shop, located directly across the street. He claimed the business was “poisoning” the neighborhood with chemical emissions from its paint (see “E-mails of the Week,” page 7). Employees at Rich’s said that Vanciel had initially been a friendly neighbor, sometimes visiting the shop for assistance with, for example, assembling a bicycle. But they said the relationship went sour about the time Vanciel’s wife moved away, after which Sanchez moved in. At that point, Vanciel’s allegations about air pollution began, with weekly complaints to the North Coast Air Quality Management Board. The Rich’s personnel said an inspector would visit following each complaint, make an inspection and find no violations. But the photo request earned a harsh rebuke from the two, who dressed him down for not saying “hello” first. “It was a very bizarre and anti-social reaction,” the man said. Sanchez had attracted his own complaints independent of Vanciel. One caller to APD complained that his pygmy goat, Love, couldn’t be happy parading around on city streets. “That’s no life for a goat,” the complainant said. Others found the somewhat exotic animals a welcome, even comical sight. On passing HSU’s Wagner House one afternoon, the staff of KHSU were all but enraptured by the sight of the yak, which station employees not necessarily skilled in animal husbandry took to be a buffalo. “Buffalo! Buffalo!” exclaimed one onlooker. But other interactions with the public were increasingly tense. As the bad vibes multiplied, the number of signs espousing love and social harmony on Vanciel’s house proliferated. Underlying his problems with the City, he said during the yard interview, was the hidden hand of City Councilmember and adjacent property owner Alex Stillman. He claimed that her property to the east of his home encroaches over his fenceline by two feet. He tied this in with what he said was a natural spring in his front yard, which he said he tried to register with the City. “I was laughed off by the building inspector,” he said. Vanciel suspected that Stillman and possibly others were attempting to steal his water rights, as the fresh water source in his yard was a key source of non-fluoridated water. He further claimed that fluoride was being used as a mind-control agent to induce docility and compliance in the populace. Stillman said she had tried to contact Vanciel, but was unsuccessful. She said she was open to discussion. “I’m in the phone book,” Stillman said. Vanciel asked this reporter whether he had heard that he was a paranoid schizophrenic. Told that this had been suggested by a neighbor, Vanciel became enraged and began beating on his mailbox with a stick, then went inside his house, terminating the interview. As the reporter departed, Sanchez then took up the tirade, yelling from the yard that “You’re a hater – you don’t even love Tad, and he loves everyone!” Vanciel then emerged from the love-and-peace slogan-slathered house to blurt profane epithets at the reporter. Nonetheless, Vanciel later submitted a picture to the newspaper depicting him, his yak and a goat on the Plaza. It was published on the front page of the May 11, 2011 Arcata Eye. Adding to the confusion over the animal, City officials believe the animal is a yakalo – a yak/bison hybrid better adapted to the Humboldt climate. One neighbor respected Vanciel as a rugged individualist with certain personal issues, but not malevolent in any way. The neighbor said Vanciel was happy and calm when at home with his beloved animals. As of mid-June, the house appears vacant. 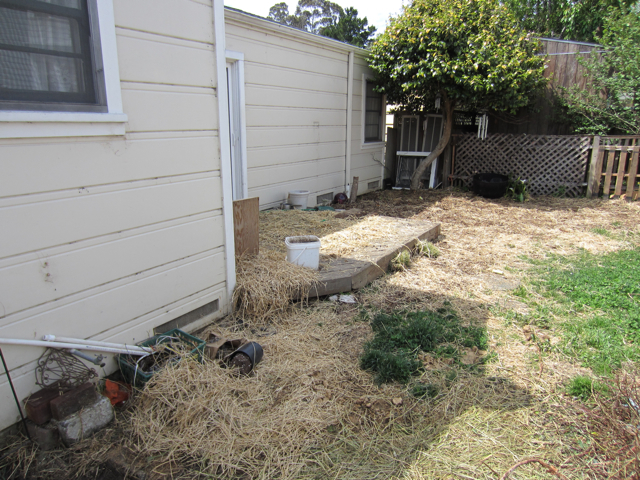 The backyard was strewn with straw and animal waste. Warning letters from the City are posted in the front window, with Vanciel’s name redacted. Vanciel was overheard at Hensel’s Hardware telling someone he was moving out of state, presumably with the animals. 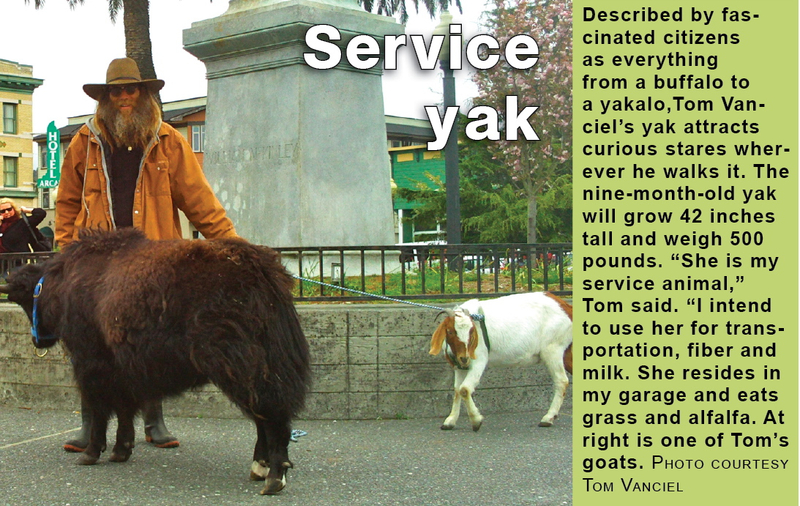 Note: In recent months, Tom Vanciel and his yak, along with his roommate Samuel Sanchez and his goat, have attracted a lot of public interest as they wandered about town with the animals. The home they shared at 1250 K St. also attracted attention of an official nature for its livestock population. Below are attempts at communication with Vanciel over the past month. The only editing was removal of his e-mail address. – Ed. Know your water well ! I do not know anything about you other than what I’ve been told by the owner of Love. I have read your paper and was amused at first by your irreverent treatment of the police log. However I have come to experience the Police Problem here in Arcata first hand. You have a civic charter and government license to report the truth, not distort for amusement. If you would bother to investigate the stories of Geronimo or Brent or Tad rather than make sport of their plight you might be trusted to report real news. Would Pvt Manning trust a tool like you? Tool for if you knowingly sport and propagate the hate towards the “least of these” you are not a friend to the reader. YOU, stopped by my house today with entirely the wrong posture. To start your interview with a Query you knew to be false, “Is that Love?” referring to the kid goat in my arms, was not conducive to establishing trust! You admitted that you had heard I was a Paranoid Schizophrenic. So I ask you, and your readers, what was your motive for arriving ambush for a interview in an adversarial stance? Did you illicit the response you wanted? I invite you back for a proper interview to share with your readers the Full story of why Arcata Is not the Liberal City it boasts. I Challenge you to share the full story behind the fluoride in your water. I’ll gladly reveal tactics that can be deployed against a whistle blower. I can share how signing a petition barring recruiters form High School Campuses will invite an Audit from the IRS of NON TAXABLE income. Where the truth is subservient to Profit. Tyranny rules! I am a Veteran on a Pension. Who else dares to speak the truth. The Gentrification conspiracy which closes bathrooms and stops feeding programs, is also willing to grease the wheels of their economic machine with the financial corps of a disabled veteran. Please share with your readers the revelations I given you about my neighbor Alex Stillman. Ask Alex when you interview her why it is that Rich’s Paint Shop is allowed to poison the lungs of 500+ residents in this residential neighborhood? some of whom are her tenants? I apologize for creating any offense. I mean you no harm and only wish to understand your story. I did not know that the animal you were holding wasn’t Love. I was trying to break the ice. Thank you for asking me back. Perhaps you could let me know when you might be willing to chat. I don’t wish to disturb or upset you. Please feel free to call me at 826-7000 any time. You really do need to stop drinking the tap water. Fluoride effects the higher reasoning skills in adult humans. I was giving you the benefit of doubt regarding your query of the goats name. If your are honestly telling me that you thought that an infant goat could possibly be the same goat from a year ago your reasoning skills are truly dulled. This is the effect desired by our government. Florine is a by product of the nuclear weapons production industry. It has been used to mask the radiation exposure of civilian populations near nuclear facilities since the first spill in Hanford Washington during the 2nd ww. with the extensive atmospheric test of the 50’s it became necessary to fluoridate the populace to mask the exposure which would later manifest as Cancers. I get to be exposed to Solvents from Rich’s Auto Body. which produce a blood chemistry that triggers anger. This chemistry is known to the State Of California. Regulations are in place to control exposure. The lack of enforcement of those rules are what needs to be investigated. Plutocracy, I suggest, is the cause. I’m afraid I don’t know your animals, having only seen them from a distance. It was a clumsy error, and again, I apologize. I wonder if I could talk to you some more about the issues you raised. I see that the City is considering some kind of enforcement against the way you are using your property. It’s an unusual situation which could become a news story. I am glad to see that you have a working relationship with the police which allows you access to inter workings of this facist puppet dictatorship of Mendoza. If you would care to enlighten me to their planned enforcement I would bee happy. Have you discovered anything regarding my allegations over the spring in my yard? I discovered that as of 2003 state laws considers it a crime to allow the discharge of such a spring to enter public waterways or land and is subject to fines of $50/day not to exceed $1000/day. The question still begs to be asked how it is the city can stand blind and allow the sale of this “pig in a poke” property. it was the city that paved over the damage caused by the spring. It was the city that plumbed the current fix. If you can answer some of my questions I will answer yours. Your sign-festooned yard and animals have attracted public attention. People are asking the newspaper what is up with your situation and I am trying to find out. It looks like I will end up writing a story at some point. I hope that it accurately represents your side as well as everyone else’s. My central mission is telling the readers what is going on in their town. I didn’t talk to the Police Department. I asked Community Development if there was any enforcement activity going on with your animals, and they gave me a Feb. 23 letter to you. Anyone can walk in and get that, as, like all City correspondence, it is a public document. I don’t know what they plan for enforcement, and from what I understand, neither do they at this point. I’m not exactly clear what your allegations are; certainly not well enough to report it. Perhaps I need a refresher on that. The question still begs to be asked how it is the city can stand blind and allow the sale of this “pig in a poke” property. it was the city that paved over the damage caused by the spring. I wasn’t aware that there was any damage. What was damaged? This entry was posted on Wednesday, June 15th, 2011 at 5:18 pm	and is filed under News, Community. You can follow any responses to this entry through the RSS 2.0 feed.